If you’re a meat lover, you’re going to LOVE this recipe! Even my daughter who tends to shy away from sausage ate an entire piece. 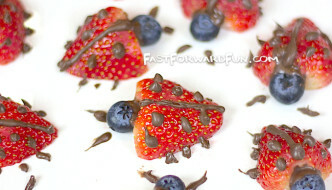 The best thing about this recipe is that it is a lot of FUN! It certainly isn’t the usual boring bowl of cereal or eggs with toast, so if you’re up for an adventure and bragging rights, give it a try. It turned out DELISH! My husband and I were pleasantly surprised with how well the roll actually stayed together. We were a little worried at first that it was just all going to fall apart into a scramble, but as you can see from the pictures, the final presentation turned out rather nice. 1. Preheat your oven, and bake about 20 tater tots (or more for snacking) according to the package directions. 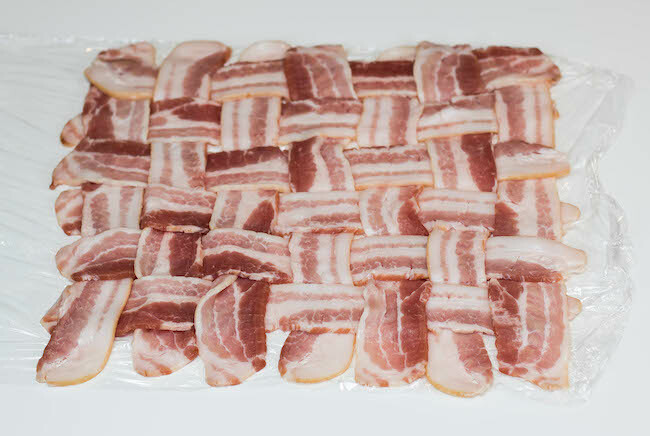 While they’re in the oven, weave 12 pieces of bacon on a piece of plastic wrap to create a square “blanket” (watch the video for this one! ), and set aside for later. 2. 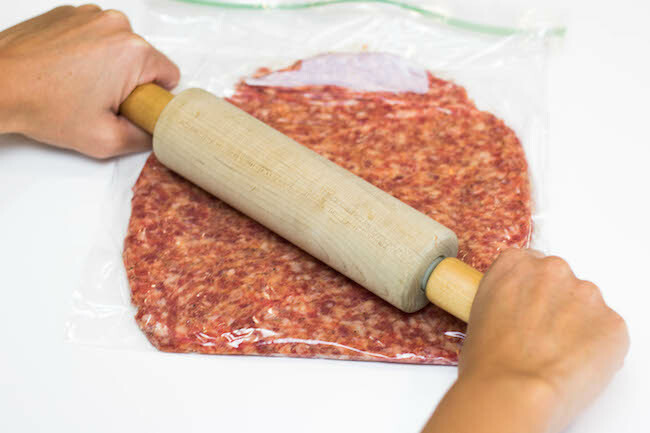 Place the sausage into a gallon size plastic bag, and use a rolling pin to flatten it into a “squarish rectangle” (I hope you don’t like specific, clear-cut instructions), leaving the bag unzipped so that the air can escape. Try not to let the sausage touch the edges, with the exception of the bottom. Use a sharp pair of scissors to cut off the two side edges of the bag, so that you can easily lift the top flap up for the next step. 3. Remove your tater tots from the oven, and scramble 2 eggs. Place 4 pieces of sliced cheddar cheese on top of the sausage, leaving about a half inch of sausage exposed on each side. 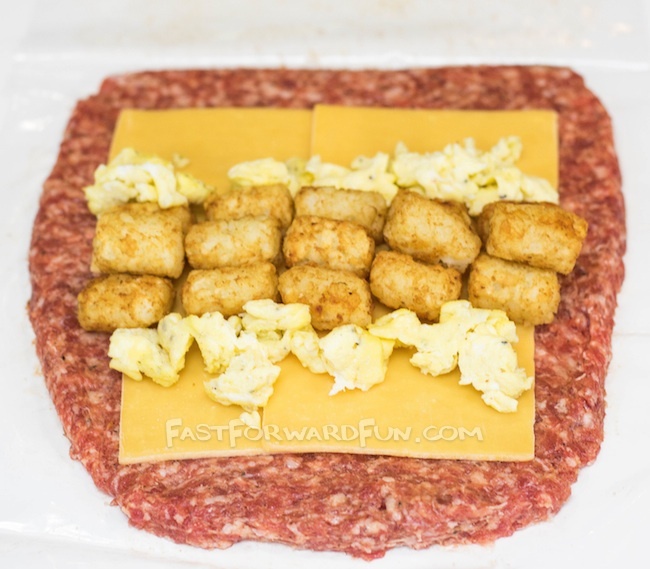 Top the cheese with 15-20 of your tater tots, and finish with scrambled eggs, just like shown in the picture. 4. 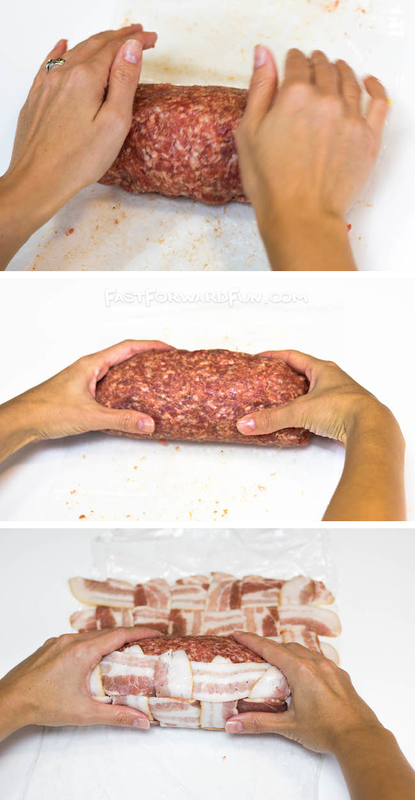 Now, carefully roll the sausage up to enclose all of your breakfast ingredients. You may have a few tater tots try to escape– just stick those little guys back in there and mold the sausage so that you don’t have any openings. 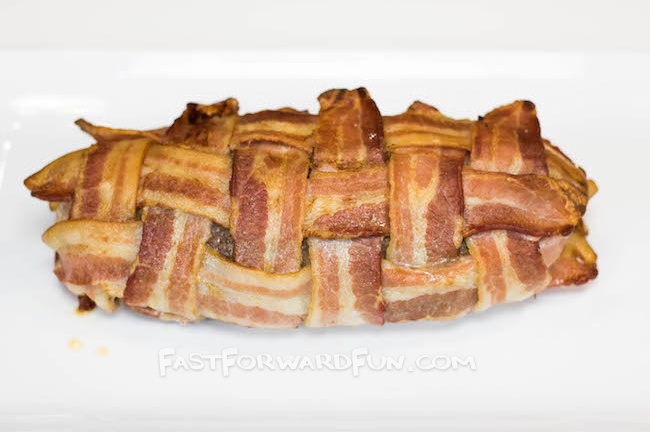 Place the sausage roll on top of the bacon weave, and repeat by rolling it until the sausage is completely encased with bacon. 5. 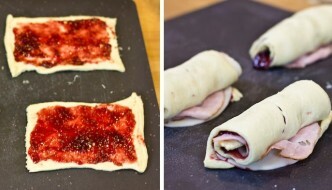 Place the roll on a wire rack on top of a cookie sheet that is lined with foil. Bake for approximately 45-60 minutes (maybe less so keep an eye on it, but my oven took almost an hour) at 375 degrees. 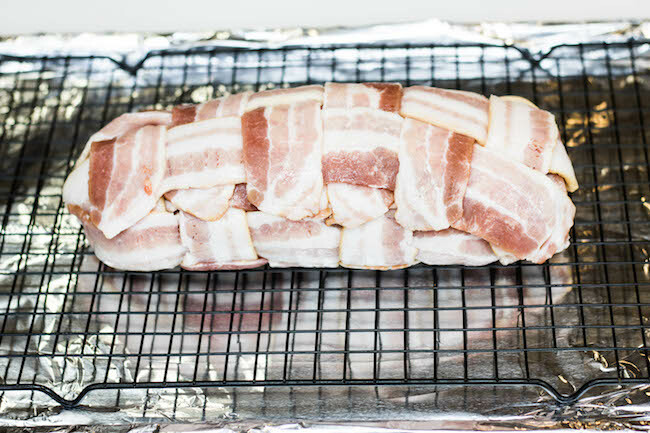 FLIP IT HALF WAY THROUGH so that the bacon and sausage cooks evenly. 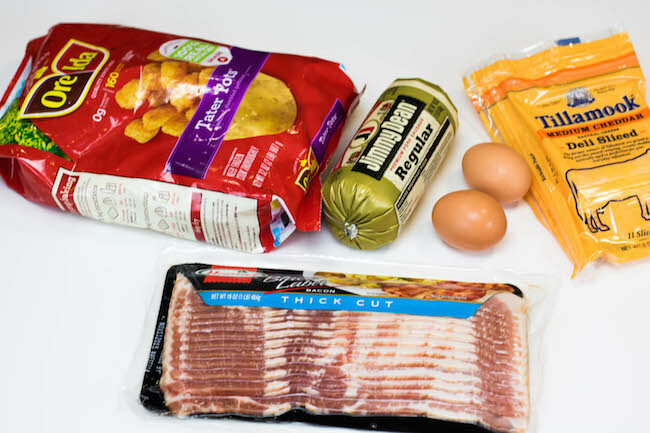 If you like your bacon really crispy, you can switch your oven settings to “Roast” for a few minutes towards the end. 6. Remove it from the oven and let it sit for a few minutes. Cut into the roll to make sure the sausage has cooked all the way through before serving. Would you look at THAT?!! 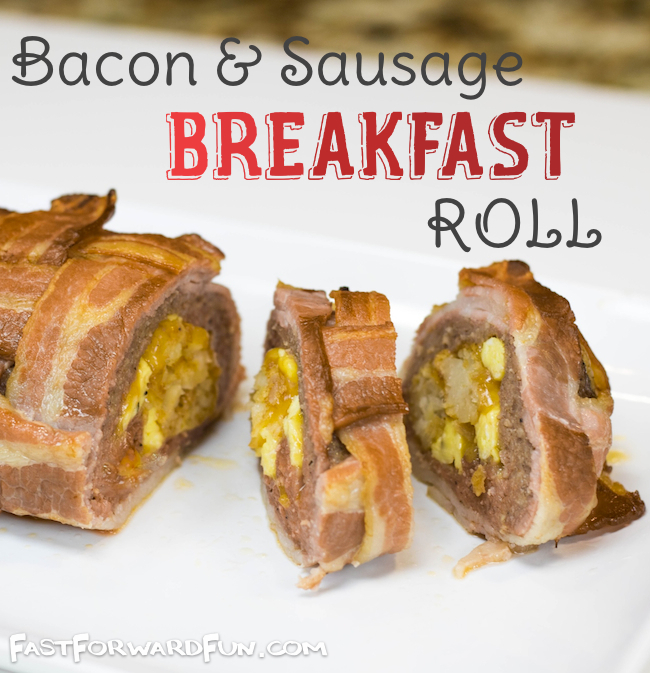 It’s like the ultimate breakfast sushi. I really expected it to fall apart when I cut into it, but the pieces stayed together so nicely, and it tasted as good as it looked! 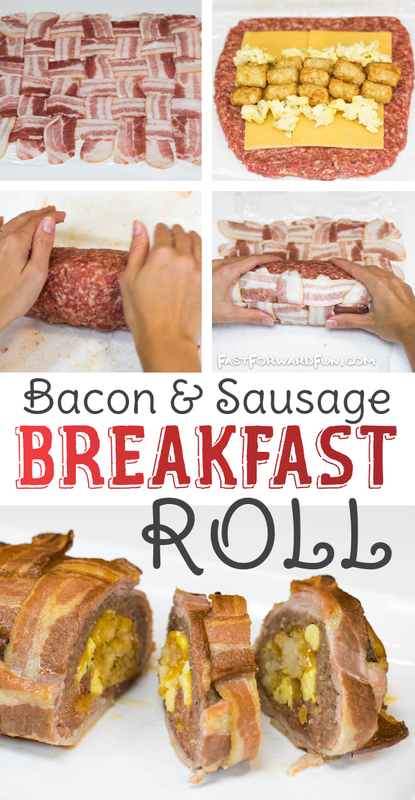 My family and I were definitely impressed with how good this turned out, but it would have been even better served with a piece of toast because it is very meaty. 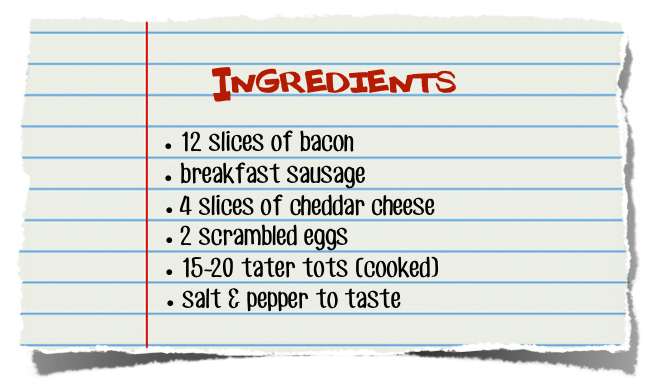 In fact, if you leave out the tater tots, it is a really low carb breakfast idea.